There are three "rails" of wattage in AMD's architectural plan for its CPUs: its higher-performance SE line, its lowest-power EE line, and its hybrid HE line that trades some performance for power savings. Two months ago, AMD introduced its first six-core Opterons in the SE flavor first, setting the general trend for future rollouts; last month, it trotted out the HE hybrid line in that same series. Today, as expected, the company is announcing stage 3 of its plan: the rollout of its first ultra-low-power six-core Opteron series, including the model 2419 EE, with 40 watts of average power consumption (ACP) clocked at 1.8 GHz. This time, AMD's value proposition is this: Server centers that already have quad-core 75W Opteron-based units can replace them for dropped in 40W six-core units, and see better performance per watt while gaining two cores per socket in the process. "We're still able to achieve up to 30% higher performance, as well as just above 30% higher performance-per-watt in that particular processor," stated AMD Senior Product Manager Brent Kirby in an interview with Betanews. 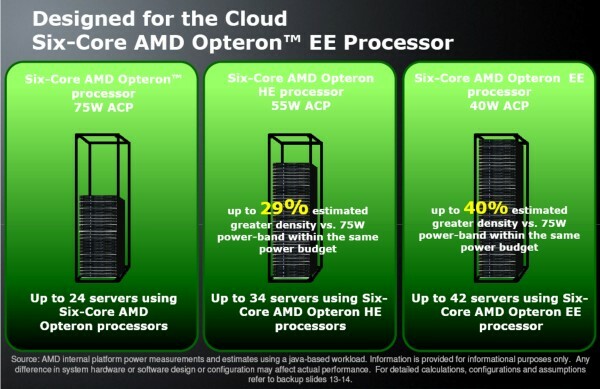 Another formula that works to AMD's advantage in this demonstration: A rack with 24 servers, all using AMD's current line of six-core Opteron SEs at the 75W power range, could be traded for a rack of 42 servers using new six-core Opteron EEs at 40W, and stay within the same power envelope. But what is the performance trade-off, if any? Or to put it more bluntly, will those 42 EE servers perform any better, or even worse, than those 24 SE servers? We asked this question a number of different ways, and the answers we got harked back to a now-familiar AMD theme: For the customers who would consider buying EE in the first place, raw performance isn't a real factor. "For a lot of the cloud [server] guys, honestly, they realize that their computational utilization is not as high. It's more about I/O and memory bandwidth, and getting them more memory," responded Kirby. Of course, they're trying to get the right balance of cores, but they're also wanting to make sure they get enough memory capability, as well as I/O capability, within these servers. It becomes a more important criteria than just raw compute power." The importance seems a bit clearer when you consider AMD's assertion that the power savings per server rack could come up to $50,000, or could surpass $1 million per year for a data center with 25 racks. But that assumes workloads stay the same, and a more accurate assessment of actual power savings when two racks so configured are given similar workloads, has yet to be conducted. Suffice it to say that the EE's SPEC scores are indeed impressive: A two-way server running a pair of Opteron 2419 EE six-core processors scored a 1,614 on the SPECpower_ssj2008 benchmark test, compared to the same brand of server (ZT Systems 1224Ra) running a pair of quad-core Opteron 2384s, which scored a 1,166 on the same test. That's to say, the 2419 delivered better efficiency for the performance it did deliver. The EE rollout isn't the only news from AMD this morning: Senior Product Manager Bart Arnold confirmed to Betanews that throughout the first half of next year, the company will bring back its 4000 and 6000 product line designations, to accompany the 2000 and 8000 series it's been running with this year. This according to a plan first put forth last April. "The 6000 series will be aimed at the performance market; that's our 'Magny-Cours' product. It's going to have two variations: one 12-core and one 8-core," stated Arnold. "Then in the second quarter, we're going to be releasing our C32 'Lisbon' platform, the 4000 series. That is going to be aimed at the market that is very concerned with power efficiency as well as cost-efficiency; the people who are looking to get a little more bang for their buck. It's not going to be quite as robust, it's not going to support as much memory, but...when we release the EE version of that platform, it's going to be really eye-popping low. I can't really tell you at this point exactly how low yet, because we haven't been able to test it, but we are planning on setting the power efficiency market on-end with that particular product." But once again, the questions will probably include, how much or how little of a performance tradeoff will there be, for those investing in the 4000 series; and what gains will data centers experience by going all the way with a 12-core setup? "I think the answer to that is found in consolidation," Arnold responded. "I think that the number of cores that the product is going to have, along with the memory scale with its four memory channels, will allow them to run, in the case of virtualization, a whole lot of virtual machines to consolidate their data center further." Here, AMD's director of client marketing, Bob Grim, chimed in: "One of the key things, from a power perspective, we're driving home all the time: If you move to a 12-core Magny-Cours in a single socket, versus two six-cores on a two-socket platform, the move to that single socket has a profound effect on reducing power consumption or inefficiencies at the platform level. From the onboard CPU power supplies, the drn's [drain voltages] are reduced...Power supply sizes can be reduced. You can put 12 cores in a single socket...at a lower power threshold than having to power two CPU cores. Then you have two separate memory VRMs [voltage regulator modules] on a two-socket versus a single-socket. Then the extra fans required to cool that. So there can be some power efficiency benefits to moving to a single socket 12-core." So it would appear that AMD's typical value proposition, including with its latest EE announced today -- just drop it in place of your old Opteron -- has a limited shelf life to it. Once the 8-core and 12-core era is upon us by Q2 2010, the argument will change to one that emphasizes the benefits of moving from a two-way to a one-way server. Just after that time also, AMD's Brent Kirby confirmed to Betanews, the company will begin making its argument in favor of shifting from DDR2 to DDR3 memory, once costs are no longer a prohibitive factor -- Kirby's timeframe sounded to us very much like August 2010. Many of our regular talks with AMD thus far have begun with the oft-repeated phrase, "The market is moving," which is sometimes augmented by "The market is broadening." Come next July, we expect to hear both phrases used again, but in new and different ways.